The Kendall Howard Wall Mount Charging Station is one of the only thin wall mountable electronic charging cabinets on the market. It holds 8-12, 12″ tablets (or laptops depending on size) and includes a power strip to charge multiple devices at once. 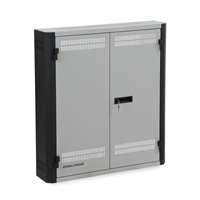 To keep these valuable devices safe from tampering or unauthorized use, we’ve equipped the shallow cabinet with locking, dual front doors. Its low profile design makes the Wall Mount Charging Station suitable for multiple environments including offices, retail stores, classrooms, training centers, and more. As technology and equipment continues to evolve, this is one product that will stick. It’s a universal charging and storage center that is not proprietary to any tablet or charging style. Keep your devices at an optimum battery life with the Kendall Howard Wall Mount Charging Station – a low profile solution that has power and security all in one! Keep cables and cords in place with the Adhesive Backed Cable Holders. These self-sticking, rounded holders have a “mouth” to hold cables in place and avoid being tangled with other cables. 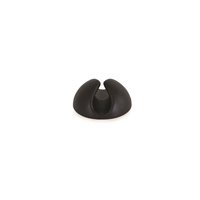 They are made of a soft plastic material to help prevent damage or wearing of the cables. Once the holder is put in place, it will be a permanent hold for your cables. The Adhesive Backed Cable Holders are suitable for cables within a Wall Mount Charging Station, LINIER® Wall Mount Cabinet, 2-post rack, or other network enclosures. 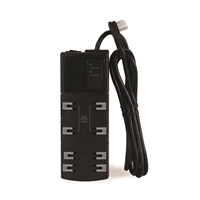 With the 8 Outlet Power Strip you can charge devices directly inside your network cabinet or enclosure. This power strip has an eight foot cord giving you room to maneuver it from inside the cabinet to a wall outlet. The 8 Outlet Power Strip is suitable with many network products including a LINIER® Full Size Server Cabinet, SOHO Cabinet, Corner Wall Mount Cabinet, and the Wall Mount Charging Station.